For some parts of the state, the outlook for the upcoming harvest is particularly positive. Indications are that yields will be good and the prices very good across all grains. So what do you do with the harvest proceeds? How do you invest your hard-earned cash so that it reduces debt and helps you build future wealth? 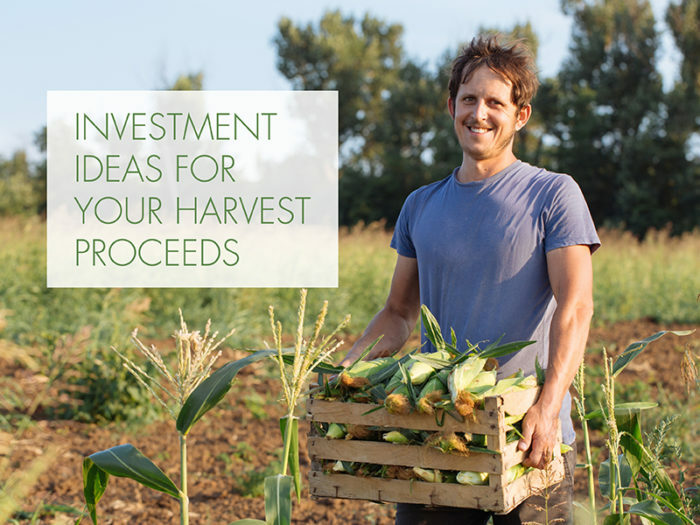 Harvest proceed investments: What deposit options are available for your hard-earned cash? The priority for most farmers in the state is to reduce debt. Any extra funds should not be left in the bank account as they will earn only nominal interest. A term deposit is an option but this should only be in conjunction with a cash flow budget. This is because notice periods apply and the cash may not be readily accessible when you need it. Another type of deposit to consider is a Farm Management Deposit. The benefit of this is that it will delay the tax payable on the amount of the deposit. The downside of such a deposit is that the funds must remain there for a minimum of 12 months and will then be assessable income on withdrawal. An alternative to deposits is to place your funds in a conservative investment portfolio that can be turned back into cash in 3-5 business days. The returns generated by such investments over the last three years have averaged about six percent per year. That’s far better than current term deposit rates of 2.5 percent. For an investment of say $400,000, the portfolio will potentially return $14,000 more than a term deposit over the course of a year. Higher levels of return are possible but they come with a greater level of short term risk. The risk is not that you will lose all your investment but that the value of the investment will be lower when it comes time to redeem it. An investment portfolio might be the start of an off-farm investment package. This can be a good long-term strategy particularly if you’re looking to pass the farming assets onto the next generation. The earlier that you start building your portfolio, the better the position will be when it comes time to pass over the farm’s assets. Such a strategy is also a relatively low-maintenance option compared to, say, investing in a rental property, which requires looking after and provides limited access to the capital. Talk to our financial advisor, David Williams, if you’re contemplating your harvest proceeds investments. It’s really important to receive impartial advice that is suited to your circumstances and your appetite for risk.